Like cool sounds? This 37 key synthesizer packs a punch with a compact body, full on vocoder and eight voice synth engine. Great for stage performance or studio recording. eBay's used Korg R3 Synth listings. A full-fledged music synthesizer that provides an easy and affordable way to have sophisticated synthesis and advanced sound creation at your fingertips. The sound generator section of the Korg R3 synthesizer vocoder uses the same modeling technology used by the KORG RADIAS, delivering thick, gutsy, and crisp analog sounds. With quality that will satisfy both professionals and beginners, the R3 synthesizer vocoder is a good choice for adding synth sounds on stage or in music production. For each voice, the R3 provides two oscillators. Possible to select an external audio source connected to the AUDIO INPUT 1 and 2 jacks. To enhance the basic analog synthesizer waveforms such as the sawtooth, pulse and triangle waves, you can apply cross modulation, pulse-width modulation, unison voice-thickening, or even VPM (Variable Phase Modulation). Oscillator 2 (OSC2) gives a choice of four waveforms such as sawtooth and sine, and can also be used as a modulation oscillator to apply sync modulation, ring modulation or a combination of the two for distinctively analog synthesizer sounds. The noise generator (NOISE) produces white noise, and provides a useful way to create breath noise for wind instrument sounds, or to produce evocative sound effects. The sawtooth wave and pulse wave use the same basic low-aliasing design as the AL-1 Analog Synthesizer found in Korg's flagship OASYS synthesizer. The R3 has a very nice vocoder, letting you use your voice to add a distinctive tonal character to the sound of the oscillator, creating "speaking" tones. The vocoder consists of sixteen filter bands, and can replicate the classic vocoder sounds of the past, as well as letting you dramatically transform the timbral character by adjusting the level and pan of each frequency band to create absolutely original vocoder sounds. 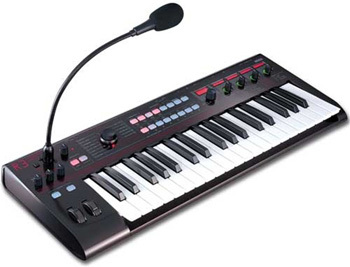 The R3 comes with an XLR-connector gooseneck microphone, so you can start enjoying this superb vocoder functionality right away. The stand-alone R3 Editor allows you to edit sounds in greater detail than is possible from the R3 itself. Viewing multiple parameters and graphical cues on your computer's screen makes it easy to create full-fledged sounds in any category. The R3 Plug-In Editor offers all the same features, and lets you use your R3 as a plug-in synth from within any VST, Audio Units, or RTAS format DAW software system. As a librarian program, the software lets you build up an enormous stash of sounds that you've created on your computer. The center and right portions of the panel are primarily for customizing and controlling sounds. Simply use the dedicated Category controls to choose your sounds, and use the Easy Setup area to specify their volume, octave, and effect send amounts. Dedicated panel knobs are provided for tweaking the effects and the EQ. You can also choose to split or layer multiple sounds on the keyboard. These settings are collectively called a "Performance," and you can store 20 of them in internal memory. The Performance area to the left side of the panel is used for deeper editing as well as for recalling these Performance settings quickly and easily. The R3 provides a variety of controllers to make your performance more expressive. You can produce subtle or drastic pitch and timbral changes by moving the joystick up/down/left/right, and use the octave up/down buttons and transpose buttons to shift the pitch of the keyboard. Two footpedal jacks are provided for use with a damper pedal, footswitch or footpedal, offering hands-free control. When playing organ sounds, an additional dedicated button can switch between fast/slow speeds of the rotary speaker simulator. The R3 has two external audio input jacks. By selecting an external audio source as an oscillator, you can filter the external audio source, or apply effects to it using the full range of processing potential available for the internal waveforms. This is a great way to create unique and original sounds, for processing audio loops from a computer and even playing another instrument through the R3. Each voice provides three ADSR envelope generators (EG) for classic analog synthesis control over pitch, filter and amp characteristics. High-speed digital processing ensures that vibrato, wah, and tremolo will produce extremely smooth tonal changes, and each waveform can be extensively modified via the Shape control, greatly expanding the versatility of the LFO section for creating highly complex types of modulation. Dual filter structure that can be configured in series, parallel or an individual structure allowing each oscillator to have its own dedicated filter, giving you amazing potential for generating unique tonal changes. Motion Rec function that lets you capture and replay real-time knob movements. Editing sounds is quick and intuitive, simply select a page and turn the four edit knobs. A sub-display above each of the edit knobs indicates the specific parameter and its value, ensuring that your editing will be smooth and easy. LED indicators are easy to see when performing on a dimly lit stage. Switches that are frequently used in live performance, such as octave shift and arpeggiator on/off are located for easy access. In addition, there's a Formant Motion function that lets you capture the movements that occur in the vocoder's filter bank when you route your voice through it. By playing back these movements you can produce vocoder sounds without inputting your voice. The R3 lets you record a maximum of 7.5 seconds of Formant Motion data into each of sixteen internal memories, and use this data in multiple vocoder programs. With the factory settings, the bank marked FORMANT MOTION on the dial contains preloaded programs that use formant motion data. The Korg R3 uses a simplified, easy to use, and great sounding effects section. Each timbre can be appied with two insert effects and EQ, plus there is a master effects for reverb, delay, etc. For each timbre you can apply a two-band EQ and two Insert effects. There's also a Master effect to apply reverb or delay etc. to unify the entire program. For each effect, there is a choice of thirty different effect algorithms. The delay time and other parameters that use an LFO can be synchronized with the arpeggiator or to an external MIDI clock. Syncing can be extremely useful for both recording and live performances. Six different arpeggio patterns are built-in (UP, DOWN, ALT1/2, Random, and Trigger). For each of the possible eight steps you can specify whether a note will sound and the duration of that note, letting you produce unique phrases with rhythm variety. Used Korg R3 Synth listings.